Sew Slowly: Learning to stretch! Here it is in the middle of the rest. I think it looks fine, so will try a bit more of this and see how far I can take it. Leaving aside the mess of random squares on the right hand side of this (it's okay, I already knew I was messy!) I can see some things I don't like as well as lots I do in this picture. At the moment the strip horizontal strips are a bit too chunky for my liking, but as they are not yet joined to anything else I'm hoping they'll look better once I've lost the extra bit in the seam allowance. Also the lower gold strip is not right - I think I don't want it directly beneath the top one. Luckily it's not joined to anything, it's just laid down there, so plenty of room for manoeuvre there. Finally, thanks to everyone who has expressed an interest in AHIQ. It will kick off on September 1st. After that posts will be on Tuesdays, and the linky party will be the last Tuesday of each month, so keep an eye out. The button in the sidebar is just me trying to work out how this all works! Love your colours here. 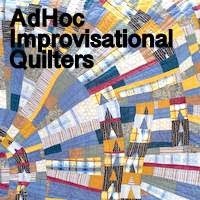 This is so interesting to read about the process, decisions, and lessons learned in both quilting and about yourself. REally made me stop and think, how intriguing, the bit about the triangles pointing up. :-) Isn't Lara wonderful...love that girl. Nice! I agree that mixing up the position of the gold stripes might be good. And I think your new block type will work just fine - I had to really look to find it. I really like how this collection of colors is coming together! How very exciting!!! Looking forward to September 1st. What a splendid button you've come up with - are we able to put this on our side bar yet? On your quilt I have to agree that I too find the strips a little on the clunky side but we don't know until we try! I do like the addition of bits of the gold. It somehow makes the blues even more vivid. And about the chunky strips--it's always amazing to me how much a block's look changes when the seam allowance has been absorbed in the sewing. I think we are all a lot more picky than we think! I think I'm quite fussy about triangle points too! I like the gold and your latest block. A lot! Adds even more interest to the quilt.